Actress Park Shinhye (Age 23) retains a fresh image at all times. In every project she joins, Park Shinhye shows the vibes and freshness like that of a newbie to the industry, and captures the curiosity of viewers. Although she has been in the industry for 10 years, the ability to retain such ‘freshness’ remains a mystery. In every project she acts in, actress Park Shinhye shows different degrees of minor to major changes to viewers, and nobody can, ever, have enough of her. Her recent projects are interesting too. In tvN’s drama ‘Flower Boys Next Door’, she is the clueless yet mysteriously captivating Go Dok Mi; in movie ‘Miracle in Cell No.7’, she makes the audience cry with the touching acting skills of hers – she uses her soul and heart to cry. Although she is just a supporting character in the movie, her acting has invited the applause of many. ‘Miracle in Cell No.7 has also surpassed 200 million viewers in the 1st week of its premiere, snatching the title of the most popular Korean movie of 2013 so far. In these 10 years, we have witnessed Park Shinhye’s growth from a Hallyu Queen to a Romantic Comedy Drama Queen. Why did you choose to take the offered role in ‘Miracle of Cell No.7’? Shinhye: My manager cried immediately after reading the script. I was curious because he is not the type of person who cries easily, so I read it. I cried immediately after reading it too. So I decided to take up the project. I wondered if I could show a different side of Park Shinhye that is different from previous projects. I took this as a big challenge to try. Although you do not have a lot of scenes in the movie, you were like taking on a lead role. You received a lot of praise for your acting skills in the courtroom. 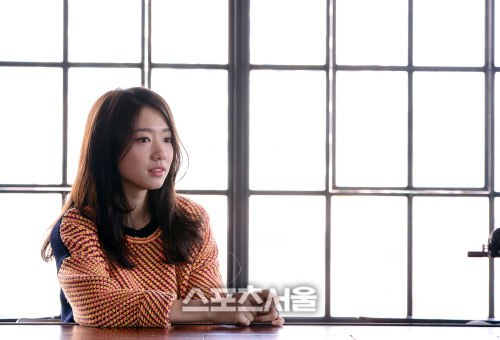 Shinhye: Watching movies and dramas of courthouses gave me a lot of inspiration and help. The presence of sanbaes also gave me a lot of help. My soliloquy in the courtroom, because of my good acting, I received warm praises from sanbaes who were present in the same scene. Shinhye: I am very happy to be praised that way. Ryoo Sanbae is like a father to me, really very very gentle and kind. He told me that I have a very determined heart. My own father said he cried after watching the movie. Shinhye: My dad said he actually cried harder watching it for the second time. He said that when he was watching it for the second time, it was like watching a new movie, and he cried harder the second time. Although you have debuted for 10 years, you are still ‘fresh’ in terms of image. Shinhye: I am not an actor with a lot of projects. Rather than being an actress, I want to show to my fans ‘the real Park Shinhye’. All this time, I am not going for challenges to try new roles. If I force myself to take on roles as mature adults, it seems like the audience cannot accept that. Seems like you have the title of being a ‘romantic comedy drama actress’. Shinhye: To be honest, although it’s a romantic comedy drama, ‘Flower Boy Next Door’ has slight differences from the past ones I acted in. It is very fun and interesting to act as Go Dok Mi. There seems to be some kind of mistake about the title of ‘Romantic Comedy Drama Queen’. I haven’t had an excellent romantic comedy in 3-4 years. Actually, after ‘Stairway to Heaven’, I tried a lot of roles, even evil antagonists. But not musicals, because I feel like, at this age, I cannot grasp musical roles with good understanding. When I was in ‘You’re Beautiful’, I felt like as if I had found a piece of clothing that suits me so well. When people call me the ‘Romantic Comedy Drama Queen’…. I really feel like I am one because people keep on calling me that. Do you have troubles of being an actress? Shinhye: New people are debuting all the time, and the dynamic acting industry is changing all the time too. Sometimes I am stressed by the thought of whether I can survive in this industry. But I know that this kind of stress is the same for many people. I can deal with stress quite well. I ride my bike by Hangang River. During summer, I enjoy wakeboarding. Shinhye: Hmm.. during Year 1 in university, I was. During that time, I wanted to enjoy campus life, but actresses of the same year like Go Ara and Kim Bum were very active in the acting industry at that time. So I wondered ‘Can I really just focus on studying?’ Because of that, I was quite depressed for some time. Have you ever felt saddened by people’s comments about you? Shinhye: Once, I had a very hurtful conversation with my parents. It made me really sad. Recently, the online comments are mostly about the movie ‘Miracle in Cell No.7’. They’re ok. But sometimes in the morning when I browse the net with my cellphone and see comments about ‘Park Shinhye and Jung Yonghwa dating’, I feel frustrated and think ‘What? Again?’. I’ll throw my phone aside and continue to sleep. Are you aggravated by the comments about you and Jung Yonghwa? Shinhye: I feel very surprised by the comments people have about us as the drama has ended for a long time already. During the drama ‘Heartstrings’, people said we looked very good together and mistaken us as a couple. Anyhow, recently I have listened to CNBlue’s new songs, they’re really good. Yonghwa is a talented musician who can act and sing very well. You are promoting your drama and movie at the same time. Do you feel tired? Shinhye: I went to the hospital ER this past Saturday. I was filming in a Art Museum at midnight, and suddenly I felt that my body was very heavy. I was saying my lines, and a ping of pain started spreading from my feet to my body. I saw a blackout. But I thought ‘I cannot just walk away now or I will be a burden to the cast and crew.’ But in the end I was sent to hospital. Lee Seung Hwan sanbae wanted to train you as a singer. If we rewind time to 10 years ago, would you still choose to be an actress? Shinhye: Definitely. Now I seems like I have more ambition to work harder and become better. Lee Seung Hwan sanbae wanted to train me as a singer, but my company said I act better than I sing, and they believe that I should be an actress. Do you have ambitions of being a singer? Shinhye: I feel like being an actress can allow me to learn many new things. I learned how to play the gayageum, I learned to ride a horse. As for my passion for singing, I can learn it with the identity of an actress. But if I only become a singer, I think I will be bored by the limitations to learn new things. What do you want to be in 10 years’ time? Shinhye: I will be 33 by then. Maybe I will act solemn, serious roles. I want to become a person with ‘Park Shinhye acting’. I still want to act when I turn 50 and 60. When I was little, I thought that if I acted well, sanbaes would say I was cute and would like me. If I become a sanbae in future, I also want to take care of my hoobaes, give them support and determination. park shinhye is a very good or i might say an awesome actress with too much talent inside her ..
i like her the way she is, the innocent look, pure image and of course the humble personality ..
but i still hope that despite all those trials and haters she would still stand tall and make her dream come true as an actress ..
park shin hye is the best for me!! she a very strong person anf she dont give up any challege cames her life!!! I felt sad in this part, seriously, as I open my facebook this interview viewed on my homepage. PARK SHIN HYE unnie! I know that we can never avoid our antis but still remember they're all insecure! I believe in your potentials that you can do everything coz you work hard on it! I can feel that you have a good heart, inside and out your an angel, coz you have a good manners to everyone. I believe that you are strong and just don't mind the antis, WE STARLIGHT ANGELS PHILIPPINES ARE ALWAYS HERE TO SUPPORT AND ROOT FOR YOU! fighting! GOD BLESS YOU ALWAYS!